GRITIT are the UK importers for Boss Snow Ploughs and Salt Spreaders. 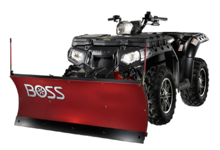 BOSS are the number 1 Snow Plough brand in the USA and are global leaders in designing and manufacturing Snow Ploughs & High Performance Salt Spreading Equipment. BOSS has a growing reputation in the UK for the highest quality and most reliable winter equipment and are known for powerful and accurate Snow Ploughs & Salt Spreaders. The harsh winters of northern USA have been the testing ground for BOSS’s design and development for more than 30 years. 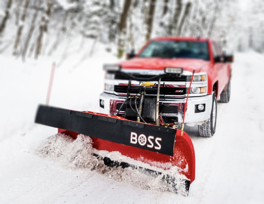 BOSS Trip-Edge Snowplows are engineered to power through the heaviest snow! When you want to complete a job in one pass add a plough blade on the front of the 4x4, UTV and trucks and a BOSS salt spreader on the rear. Ask us for advice on the best combination for your job. 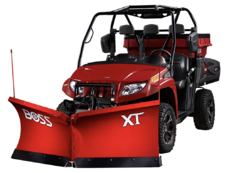 There is a BOSS snow plough or spreader that is right for your vehicle and Axel Weight Rating.